In much of his work, Samuel Levi Jones deconstructs books and arranges the parts in minimalist compositions on canvas. Encyclopedias, medical text books, and law books (seen here in Prison Industrial Complex) appear as authoritative carriers of knowledge and symbols of power. Through Jones’ deconstruction of these objects, they appear less as disembodied voices of control and influence, and more as aging physical objects that submit to the forces of time and progress. 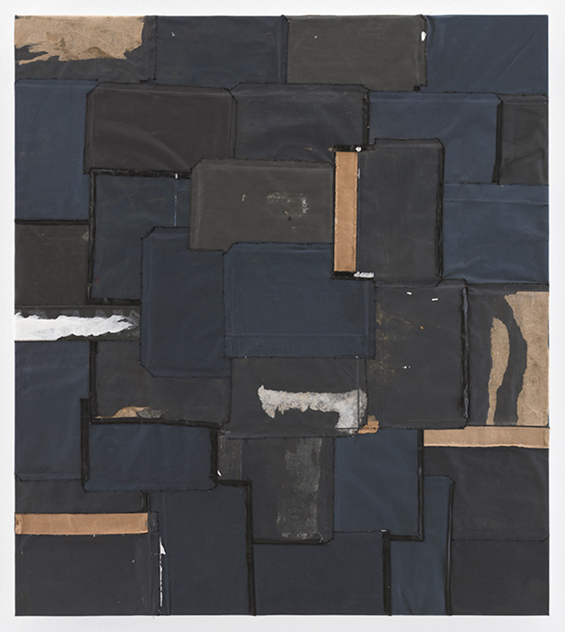 Solo exhibitions of Jones’ work include Infinite Blue at the Brooklyn Museum, New York; After Fred Wilson at the Indianapolis Museum of Contemporary Art; and Unbound at the Studio Museum in Harlem. His work can be found in a number of museum collections, and in 2014, Jones was the recipient of the Joyce Alexander Wein Artist Prize, an annual award whose past recipients include Leslie Hewitt, Glenn Ligon, and Lorna Simpson. Websites: samuel levi jones, galerie lelong & co.